Several women have stepped forward publicly in recent months with stories of harassment or inappropriate workplace behavior by former and current Washington lawmakers. OLYMPIA — New and additional harassment training. Frank conversations about power dynamics. Legislation to curtail inappropriate behavior in the private workforce. This year’s state legislative session brought a flurry of efforts to address the culture of harassment in Olympia and elsewhere. But when the session wrapped up last month, lawmakers and officials left some big questions about what the Legislature should do with its own outdated and politically tinged processes for handling workplace complaints. Chief among them: Can the Legislature create a neutral place to take reports so people feel safe speaking up? Now, Washington lawmakers, legislative staffers and others are considering an independent office to receive and possibly review harassment complaints at the Capitol. A group of House members, staffers, lobbyists and others is set to begin meeting this month and “will largely focus on how that could work,” said House Chief Clerk Bernard Dean. Secretary of the Senate Brad Hendrickson said there’s also interest in that chamber for something like an independent ombuds to take reports and conduct investigations. And more than 200 women have signed on to a letter saying a neutral place to report complaints is key to improving the Legislature’s workplace culture. House staffers have said the same thing in an internal work group this year, Dean said. The lack of an independent office is a barrier “for folks coming forward,” he added. But to establish such an office, lawmakers and officials must confront several challenges, including whether or how it would act on complaints, and where liability would fall if such a system were to fail. The House and Senate — which are each their own fiefdoms, with different workplace policies and cultures — would also likely have to agree on the details. The two chambers have largely handled workplace complaints of any kind through informal grievance processes that encourage people to resolve problems on their own, or go to their direct supervisors. Some legislative staffers, however, are directly overseen by partisan employees, and even the top nonpartisan officials in the House and Senate are approved by lawmakers. Lobbyist Rebecca Johnson said the two chambers would have to work through their differences to find a universal way to handle complaints. “We cannot be in a situation where I’m evaluating which side of the dome I was standing on when somebody made an inappropriate comment to me,” said Johnson, who has spoken publicly about an unwelcome encounter in 2009 with a now-former lawmaker. Differences between the two chambers have already hampered progress this year. The House in January passed a resolution to create an anti-harassment task force between both chambers, but it stalled in the Senate. One problem with it was that legislative staffers weren’t given a role in the task force, said Rep. Nicole Macri, D-Seattle. State House and Senate officials this year have boosted anti-harassment training for staff and lawmakers, and the Legislature passed several bills aimed at curtailing harassment in the private workplace. Meanwhile, House officials have hired a law firm to investigate the conduct of Rep. David Sawyer, D-Parkland. House officials in late February restricted Sawyer’s contact with some staffers after receiving an allegation of inappropriate behavior against the lawmaker that possibly created a hostile work environment. Eight women have since come forward saying Sawyer “crossed personal and professional boundaries” in interactions with them, according to the (Tacoma) News Tribune and Northwest News Network. Sawyer has denied any inappropriate behavior. In early March, the House contracted with the law firm Beresford Booth to look into at least some of those allegations. Described as a “workplace investigation,” the review will include interviews with the complainant and “other key witnesses,” according to a copy of the contract provided to The Seattle Times. The investigation is estimated to cost as much as $20,000, with the lead investigator earning a rate of $400 per hour, according to the document. Dean declined to comment on the investigation, citing personnel matters. In December, Rep. Matt Manweller, R-Ellensburg, resigned from his leadership position and was stripped from his job as top-ranking Republican on a committee following news reports about complaints of inappropriate behavior. Manweller faces an investigation at Central Washington University, where he teaches. And a former legislative staffer said she complained to the House last year that a meeting with the representative turned into a dinner that felt like a date. Manweller has denied any wrongdoing. The notion of public disclosure about complaints and investigations remains another tricky issue. 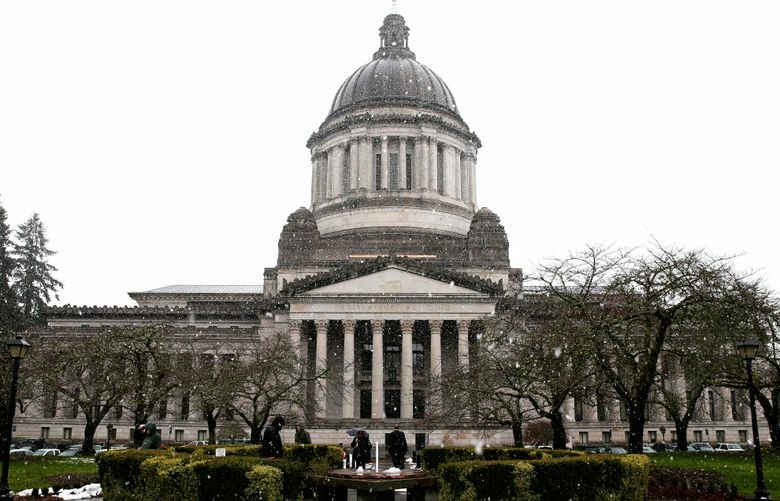 The Legislature has long maintained that it is exempt from the Washington Public Records Act, even as other government agencies routinely release investigation reports relating to harassment. Just last month, the office of Gov. Jay Inslee and the Employment Security Department released a report into allegations that behavior by the department’s leader, Dale Peinecke, made some employees uncomfortable. Peinecke announced his resignation as the report was released. Previous House officials even used their exemption in 2008 to deny a former legislative staffer access to copies of complaints she said she made against a legislator. A judge in January ruled that legislators’ offices are subject to public-records laws. In response, lawmakers passed legislation — ultimately vetoed by Inslee — that would have shielded many records, but would have made new final disciplinary reports public. But in the Legislature, most harassment complaints appear to be resolved before that stage, meaning most documents related to harassment would be kept hidden. And legislative officials could easily skirt that disclosure rule, said Toby Nixon, president of the Washington Coalition of Open Government and a former state legislator. “If there’s something they want to bury, what they would do is never finalize it, and then they don’t have to release it,” Nixon said. Both Johnson and Dean say they worry about protecting the identities of people who have been harassed. Having all records open “would have a tremendous chilling effect on people coming forward,” Johnson said. Lawmakers could find other ways to keep confidential the names of people making harassment complaints while still making documents public, Nixon said.